In addition to being cruel, knitting just loves to yank my chain. Just when I’m feeling smug about some technique that I’ve mastered, along comes a project eager to smack that confidence right out of me! While I was waiting for the yarn for the Scalloped Lace Toddler Sweater, I decided to cast on for the second sweater I had planned to knit the munchkin this fall. Several years ago, I had stumbled across A Cardigan for Merry, which was a baby-size adaptation of A Cardigan for Arwen from the Winter 2006 issue of Interweave Knits. I loved the clever reversible cable, and decided to use it as the inspiration for a sweater for my daughter. I had some Knit Picks Andean Silk yarn (an alpaca, silk, and merino blend) that I’d picked up when it was discontinued a few years ago which seemed as though it would make a scrumptious and warm sweater. It was a worsted weight, though, which meant that the cables from the original pattern would be too large for a child-size sweater. Serious swatching ensued, while I tried to determine the best-sized cable and settle on a fabric that would be dense and warm but not stiff (or unpleasant to knit). I decided that I would put a small cable at the bottom of each sleeve. Since the cables are reversible, the cuffs could be worn folded up now and then unfolded later, so the sweater could hopefully see more seasons of wear. (I had used this same approach on a Baby Surprise Jacket for my daughter which she’d only recently outgrown after nearly two years of use.) To make the cuff completely reversible, I decided to graft the cable pattern. It was top-to-bottom grafting, so there wouldn’t be any half-stitch jog to complicate matters. And after all, I told myself, I am old pro at Kitchener stitch. Grafting in pattern wouldn’t be that hard. Oh, such hubris! My first attempt wasn’t horrible, but I discovered that I needed to rethink how I’d planned to pick up stitches along the side of the cuf for the sleeve. So I knit a second cuff. That time, I used a different provisional cast on, keeping the loops live around a spare circular needles. I read a couple of articles about how to graft in pattern. I was ready! Well, that approach ended in abject failure (not to mention some rather unladylike language!). I tried again. Same result. (Well, maybe worse language, which I followed up with a beer and a good night’s sleep). The next morning, fortified with coffee, I decided to use the K.I.S.S. 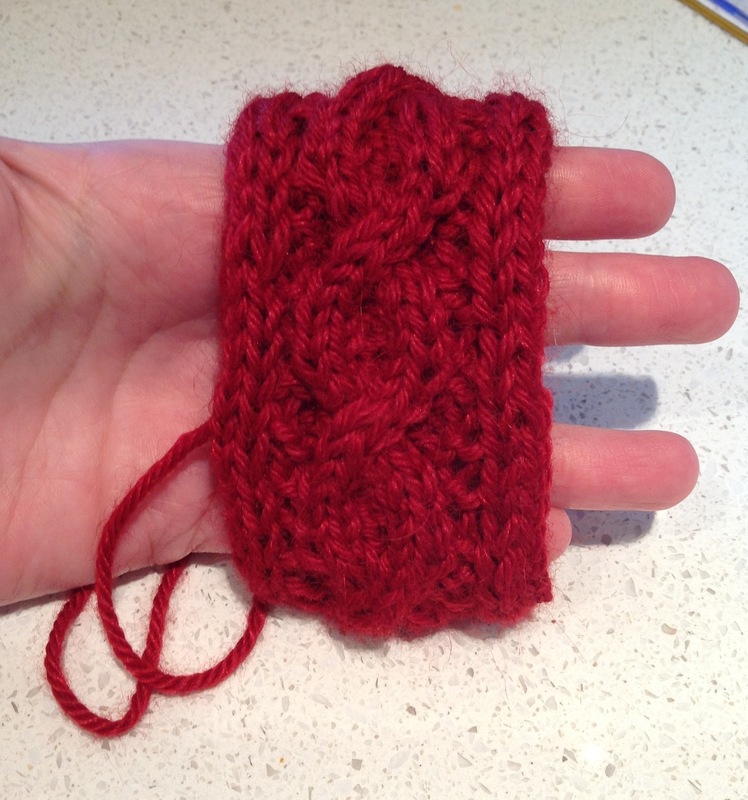 method: I cast on with waste yarn and knit four rows. I switched to the working yarn, knit the cuff again, and switched back to waste yarn for several rows at the end. Then all I had to do was follow the path of the waste yarn. Finally: Success! Picking out the waste yarn was a pain, but better than ripping out my hair! What do you think? The grafted seam is just above the end of the yarn on the left side. So tell me… what techniques give you fits?